Touch and go with Tom Ford's Traceless. 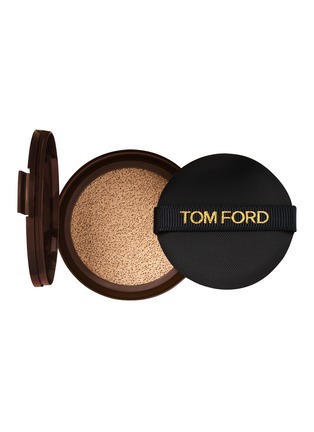 The essential step for a flawless face premieres in a portably chic Cushion Compact. Traceless Touch Foundation SPF 45/PA++++ introduces a refreshing, skin-perfecting formula with sun protection and seamless satin-matte coverage that creates a natural look on the go. Fresh, lightweight multi-tasking powerhouse cushion compact hydrates and delivers a balanced complexion that glows with vitality and radiance while SPF 45/PA++++ protects skin from the sun.